Earlier this year, Peter Knight, who is reader in Geography at Keele University published a new book on Amazon which aimed to fill a gap in the market. 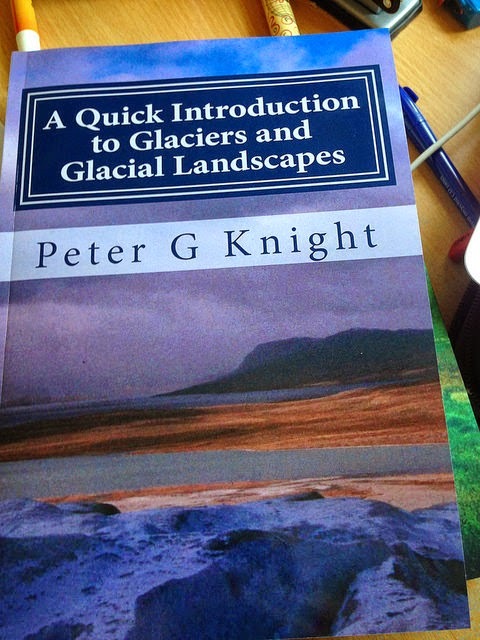 Some years ago, the GA published a book that Peter had written on Glaciers and Glacial Systems which I used to teach 'A' level Geography, and provided a perfect book to bridge the gap between school and university geography. Indeed, about 8 years ago, I had been sat in a lecture that Peter gave at the conference, and he talked about websites and textbooks (some of which are still used in many schools) which provided an inaccurate picture of the way that glacier systems work. That book is now out of print. Peter has recently published a very useful Quick Introduction book, which sits nicely alongside other books on the topic. It would be nicely used in association with Jamie Woodward's excellent Very Short Introduction (VSI) to 'The Ice Age' for example. It is a 'reboot' of that earlier GA book, slimmed down, and very much focussed on introducing the key themes and ideas. The book is available from Amazon, and we are ordering copies for our 'A' level students at King's Ely to access for next year. It's also worth remembering that glaciation is mentioned at KS3, and also plays a part in some of the new GCSE specifications. The book has 67 pages, split up into 6 main chapters, so each one can be read in a single sitting. There are plenty of clear colour images (many taken by Peter himself) and associated diagrams and tables which add clarity to the explanation of how glaciers form, how they move, and how they change the landscape. These are placed within the context of the global glacier systems. The final chapter explores the way that glaciers are affected by, and affect, human activity. There are plenty of located examples for each chapter, and the book is written in an engaging way, without too many technical terms (except when they are required of course). Information boxes, and some suggested activities complete what is a very useful book for those studying cold environments, perhaps for the first time. It would also make useful pre-reading for those students who had opted to do 'A' level Geography, so if you are planning on putting together a summer reading list for Year 11s who you know are staying on, or Year 12s continuing to Year 13, then now is the time to add this to the list. It would even be suitable for bright and engaged KS3 students who wanted to delve more deeply into the subject of glaciation.